What can I send to Sweden? What items are restricted? If you are planning to partake in some of the more energetic activities available in Sweden, such as skiing or kayaking, you may want to take your own equipment with you, instead of hiring it out when you get to your destination. This may mean that you need to take heavy or large items with you that exceed the limitations of an airline's baggage allowance, or you may have luggage that you don’t want to carry around with you, especially if you have multiple transfers before you reach your final destination. Send My Bag can help you with your heavy luggage and equipment by picking it up from your door and delivering it to your destination quickly and efficiently at a great price. Our hassle-free carrier service ensures that your items are ready for you when you reach your destination, so you can enjoy your holiday straight away without the worry of excess baggage fees. Our service is also great for those who are taking longer trips because of work, for students relocating for study and for backpackers looking to transport their bulky items safely and securely. If you are enjoying a city break in Sweden, or if you are moving there permanently, you can save yourself a lot of stress by sending your possessions with Send My Bag. This will allow you to bring with you lots of your favourite things to help you settle into Swedish life. Your possessions will be looked after for you, allowing you to get on with exploring your new environment. Send My Bag has many international routes, with affordable rates for each route up to a massive 30 kg. This means that you can bring all your home comforts with you to help you set up home abroad. To find out more about sending luggage to Sweden, visit our ‘How it works’ page, or our ‘FAQs’. Sweden, home to one of the greatest female golfers of all time, has many excellent golf courses, such as Bro Hof Slott, Falsterbo and Halmstad. You can make your journey to Sweden for your golf holiday a whole lot easier if you send your golf clubs with Send My Bag. You won’t have to drag your clubs behind you and you will also avoid any oversized baggage fees from your airline. It is so much better to be able to play golf using your own golf clubs, rather than renting some, so consider sending your golf clubs with Send My Bag. Make sure you find out how best to prepare your golf clubs for transit by visiting Send My Bag's information page on sending golf clubs. Although it may not be the first destination you think of for skiing, Sweden has a wealth of ski resorts to choose from. One of the biggest is Åre, and others include Storlien and Vemdalen. You won’t need to hire skis when you are there, instead you can bring your own by sending them with Send My Bag. If you send your skis, you won’t have to carry them with you to and from the airport and you can avoid your airline’s oversized baggage fees. To find out how to send skis to Sweden, including how to package them correctly, read our information page on ski shipping. If you are attracted by Sweden’s excellent quality of life and are moving there for good, you will have to do some research into international removals to Sweden in order to move all of your possessions. Before you hand over anything to the movers, however, ensure that all your items are carefully packaged so that they won’t get damaged in transit. Use appropriate packaging for your items and seal everything up well. If moving to Sweden to study, you will need to bring lots of your possessions with you to help set up home in your student accommodation. Apart from everyday essentials you will also need to bring textbooks and other reading material for your course, plus items like DVDs to help you pass your free time. Top-rated Swedish universities include Lund University, Uppsala University and KTH, Royal Institute of Technology. To find out more about student shipping to Sweden visit our student shipping page and get your 10% student discount. You could send a parcel to Sweden with Send My Bag. This is a good option if you have left something back at home and you need a family member to send it on to you. Or, friends and family could send you a nice care package. Make sure you choose a good solid box when sending a parcel to Sweden and tape it up well so nothing gets damaged in transit. Also make sure you know about rules regarding personal effects and brand new items (see below). Take a look at our information page on how to send a parcel to find out what you can send with Send My Bag and how to package your items. Air freight is one option for sending big bulky items, such as a dining table or a chest of drawers, to Sweden. Sending items by air freight usually takes one to two days, which is normally faster than sea freight shipping, but generally more expensive. What you have to pay will depend on the weight and size of your shipment. You will probably also have to use the services of a customs agent to handle customs clearance. And, you need to work out how to get your items to and from the airport, which means that costs could quickly mount up. 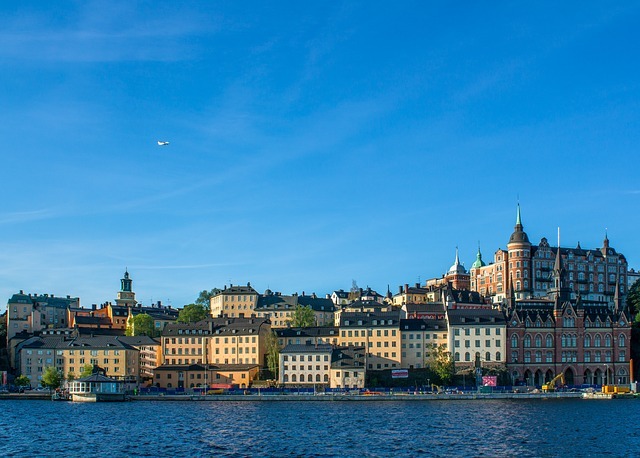 If you send internationally by air freight to Sweden your items will likely arrive at one of the major airports, such as Stockholm Arlanda or Kristianstad. Instead of air freight, you could try sea freight or container shipping to move your possessions to Sweden. Again, this option is usually used when shipping large bulky items, like a console table or a wardrobe. Sea freight usually means shipping items in large containers loaded onto cargo ships. It can be less expensive than air freight, but you will still need to use the services of a customs agent and will need to sort out how to get your items to and from the ports, which means it could cost more than expected. When using container shipping to Sweden your items will most likely arrive by ship at one of the major sea ports, such as Stockholm, Gotthenburg or Halmstad. As mentioned in my previous comment, everything that is related to this service was great, the pick up from the UK was great too. Delivery in Sweden was poor! If i can book parcels to be sent then anyone can. Will definitately be sending the rest of my bits with Sendmybag. So easy to book, quick response from customer services, but most of the information was so easy to find. Swedish customs normally only require a packing list clearly stating the contents of the shipment and their values, a personal effects form (completed online after the order is submitted) and the consignee's flight ticket (dated within the last 12 months) to complete clearance. Should further information be needed, our courier partner in Sweden will contact the consignee directly to request this. If they are unable to reach the consignee or do not receive the additional information required immediately, shipments may be cleared with duty and taxes applied, and/or incur storage charges. The consignee should ensure they provide a local Swedish contact number they can be reached on. Personal effects are usually assessed as used items that have been in the sender's possession for at least 6 months. If your bag is inspected by Swedish customs officials and they find brand new or commercial items, you may have to pay customs duties and taxes. Do keep this in mind if you are sending Christmas gifts. Please check with Swedish customs so you are aware of potential customs duties, follow any advice given and attach all necessary documentation. Customs processes and allowances do vary by country, so we advise all travellers take 5 minutes to check how their personal circumstances and what they are sending will be assessed under the prevailing Swedish customs regulations. In order to show your shipment is personal effects, you will be required to complete a brief non generic packing list online, entries to be made in the format: "5 x Cotton Blouse, 2 x Shorts, 3 x Denim Skirt", and so on, rather than as "10 x Used Clothing". Sweden’s major cities, such as Stockholm, Gothenburg and Malmö, are steeped in history and culture. Sweden is a great place to visit for a weekend or even longer. In the Southern and central parts of the country temperatures average between 20 and 25°C in the summer and −4 to 2°C in the winter, whereas the North can experience colder weather due to its shorter summers and longer winters. The official language of Sweden is Swedish, although a large majority of Swedes also understand and speak English as a second language due to close ties with Britain. Swedish cuisine, much like the rest of Scandinavia, is relatively simple, but delicious. Dishes usually consist of meat, potatoes and various dairy products. Possibly the most famous dish is Swedish meatballs, which are traditionally served with gravy, boiled potatoes and Lingonberry jam. Sweden is great for those who like the great outdoors. There are a range of activities to experience throughout the country including skiing, hiking, sailing and wildlife tours, depending on the season. For those who prefer a more laid back experience, Sweden’s cities offer some of the best nightlife and shopping opportunities in Europe.